This brick-and-mortar ceiling has a hole in it for trapdoors. The Stone Hatchframe is the second available hatchframe. A hatchframe functions as a ceiling, providing protection from the elements and giving bonuses to hypo- and hyperthermic insulation, but with the addition of a hole to allow entrance and exit. 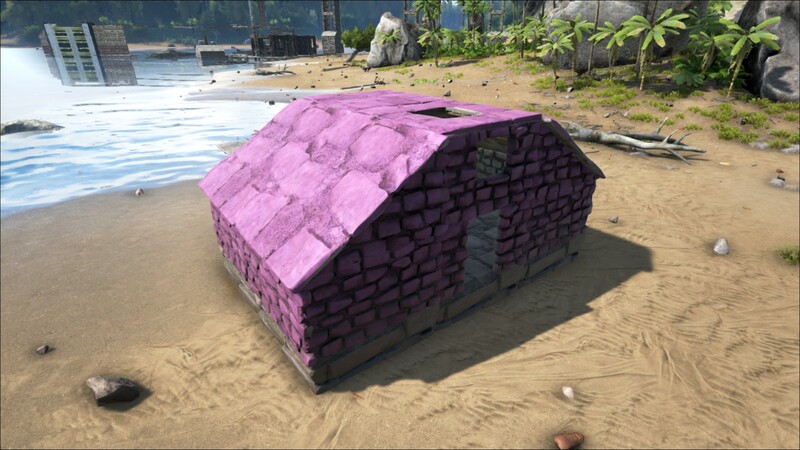 A Stone Hatchframe can be placed on any Foundation, Fence Foundation, Ceiling (with the exception of the Thatch Roof), Wall, or another hatchframe. 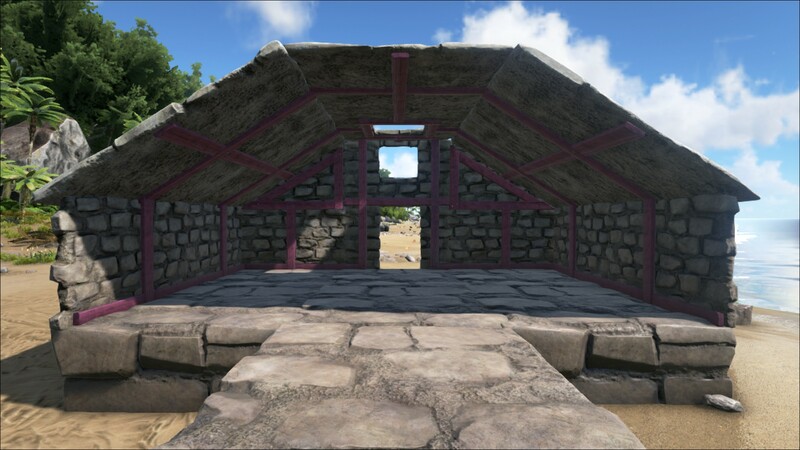 A Trapdoor can be placed in the hole and locked to provide a way to restrict access to the structure while still allowing you and your tribemates a way through. A hatchframe requires support from a nearby foundation or pillar in order to be placed. The hatchframe can only be placed up to 2 ceilings away in any direction on the x or y-axis, and up to 1 ceiling away diagonally from a wall or another ceiling that is directly above a connected foundation or pillar. 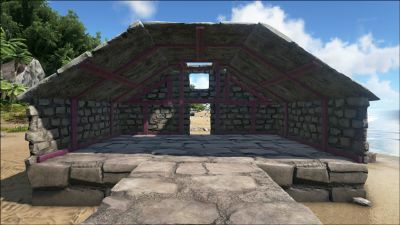 The hatchframes on the far ends of this setup will not be able to support walls. The insulation provided by a house is not affected by hatchframes, whether the trapdoor is open, closed, or missing. If a hatchframe is destroyed, any building pieces that rely on it for support will be destroyed as well. If it was destroyed via the demolish option, no resources will be refunded for these extra building pieces. 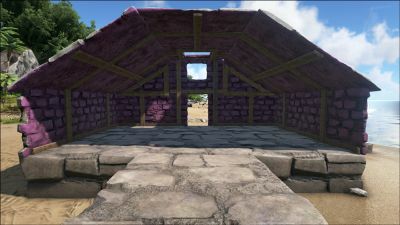 Stone structures have the same durability as their Wooden counterparts, but take significantly less damage from all sources. The Stone Wall, Stone Doorframe, Stone Windowframe, Stone Ceiling, Stone Hatchframe, Sloped Stone Roof, Sloped Stone Wall Left, and Sloped Stone Wall Right all share the same paint regions. This page was last edited on 26 March 2019, at 21:25.